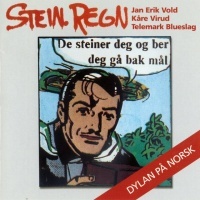 Early 1970s Jan Erik Vold reinterpret Bob Dylan's book Tarantula and several of his songs into Norwegian language. About the same time the art student Morten Juvet got to know the brothers Haakon og Arne W. Isaksen, who gave him the interest to see comic in a new light. Morten Juvet found the cartoon heroes culture poor and got an idea about giving them them a good text to perform. Like a collage of poetry and cartoon heroes, as a picture, a painting, a serigraphy. To give familiar characters a new message, opying others' series and put them together with texts he thought was good. In 1972 Morten Juvet started worked with comic characters like: "Snuffy Smith", "Mandrake the Magician", "Blondie", "The Phantom", " Dr. Kildare" and others including characters by Morten Juvet himself. The various collages have text by Bob Dylan, Jan Erik Vold, Baste Grøhn, Roger McGough, Roger Brautigan, Adrian Henry, Cecilie Løveid, to name a few. Using the lyrics in "Damer i regn nr 12 & 35" (Dylan's "Rainy Day Women nos 12 & 35") and pictures from the ongoing newspaper stories, "Tale of Aleena" and "Super-Elec", Morten Juvet created a unique collage in the intersection between pop art and poetry. This page was last edited on 22 January 2017, at 17:53.